All prices are in Canadian dollars. We use the total number purchased (ELM624P + ELM624SM) for the calculation. The Control L or LANC interface is an industry standard introduced by the Sony Corporation for controlling audio and video devices. It uses a bit serial data format, and requires that the controller be synchronized to the controlled device – something which is difficult to do using standard serial interfaces. The ELM624 is an 8 pin integrated circuit that performs the synchronizing function for you. 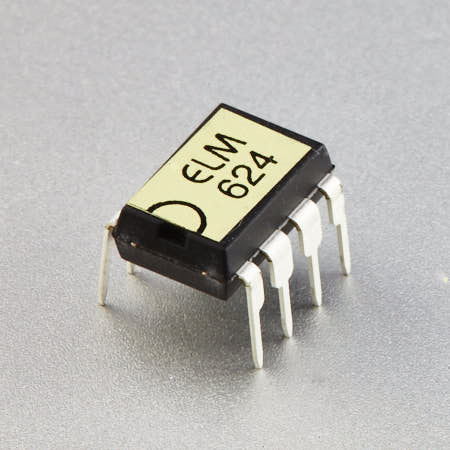 All user interaction with the ELM624 is by standard ASCII characters over an RS232 interface. There is no special formatting required, other than perhaps an understanding of the hexadecimal numbering system, nor is there a need for a powerful PC – virtually any model with a serial port will do. Since the ELM624 was designed to provide a cost-effective way for people to experiment with the Control L system, many features typically found in commercial devices, such as RS232 handshaking, variable baud rates, extra buffering of signals, etc. have not been implemented. Responses are kept to a minimum as well (eg. a single question mark is returned for a misunderstood command), but the general principles of operation are demonstrated and for many applications, this is all that is required.